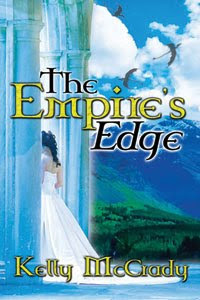 New this week at The Wild Rose Press is a preorder link for the POD paperback version of my novel The Empire's Edge. Preoder your copy today HERE. I have been informed that payment is limited to Visa, MC, and PayPal, so for all you AmEx and Discover-type folks who are anti-PayPal, you'll have to wait until March 18 and order the book off Amazon.com. Also if you crave an e-book copy for your Kindle, Nook, or other reading device, the ebook copies will become available at both TWRP and Amazon on March 18.